The Superintendent's proposed Capital Improvement Plan (CIP) was presented tonight to the School Board. This is not the Operational Budget, but the plan for building new and improving existing facilities. These are decisions related to the quality of our school system. For example, Full Day Kindergarten is not in the proposed plan but is documented for discussion. The schedule for the School Board discussion and adoption of the plan is below. 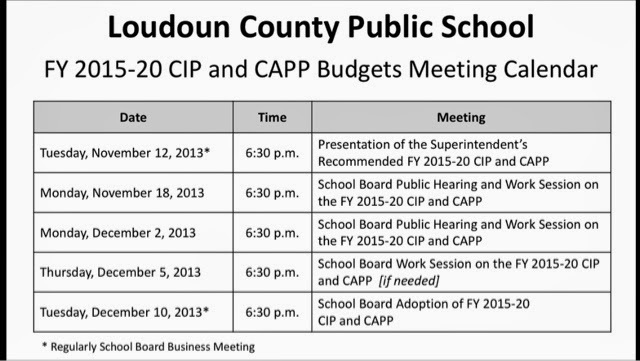 For the full plan, see http://www.boarddocs.com/vsba/loudoun/Board.nsf/files/9DDVRM820124/$file/SUPERINTENDENTS%20RECOMMENDED%20FY15-20%20CIP%20Document%20for%20WEB.pdf. Tried to cut and paste the link to get the plan pulled up and it's not available. Thanks. I fixed it to be clickable. Please try again.